In the poorer communities, children under school age often find themselves in environments unsuitable for their development and are lacking basic care and protection. 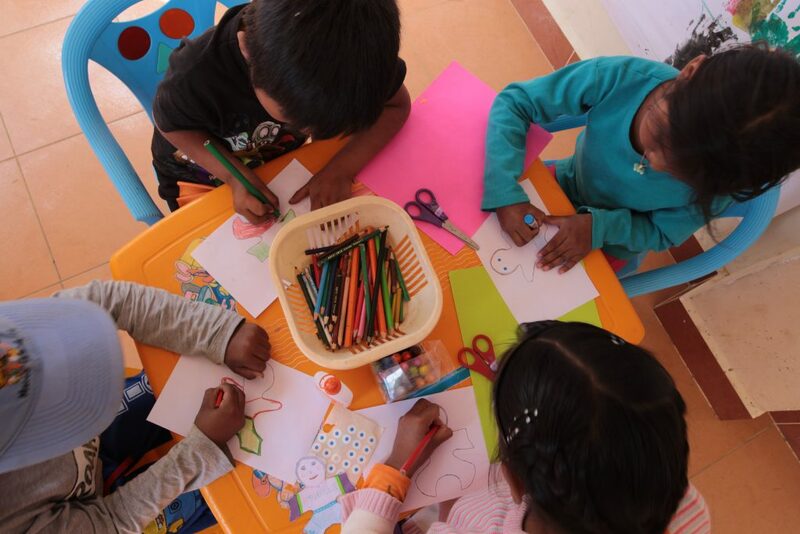 We provide a safe place where these children can participate in social, creative and educational games. In families where both parents work long hours and are struggling to provide basic needs, there are few options available for children who have not reached school age. Frequently they are taken to work with one of the parents or alternatively left in the care of an older sibling. A consequence is that they are in need of affection; they lack stimulation and they lack appropriate social contact at a critical time in their lives when they should be rapidly developing. We offer a secure environment where these kids can learn social skills, how to care for themselves, how to learn, language and literacy skills, creativity and core values. This project has the secondary benefit of relieving older siblings from the burden of care that they would otherwise have – they too are free to participate in our activities. If you would like to do volunteer work with children in Bolivia, we’d be very interested to hear from you as we are always looking for patient, creative people with or without experience, who enjoy working with small kids.